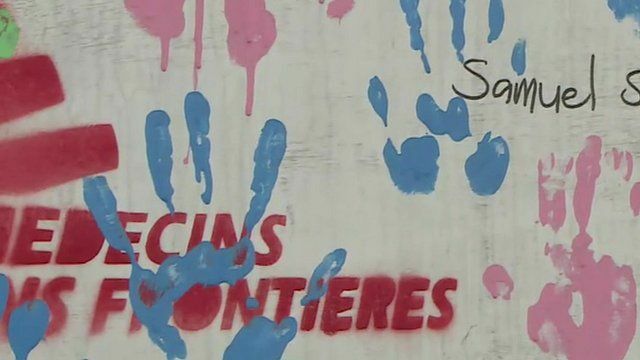 Mural challenges fear of Ebola Jump to media player A mural in a Medecins Sans Frontieres Ebola treatment centre in Liberia challenges the belief that there is "no cure" for the disease. Ebola health worker monitored in UK Jump to media player A British military healthcare worker has been brought back to England to be monitored for signs of Ebola after being injured with a needle in Sierra Leone. Concern over Ebola virus mutation Jump to media player Scientist in France who are tracking the Ebola outbreak have said they believe the virus could be mutating. Volunteer: 'I've played my small part' Jump to media player One of the volunteers who took part in the first human trial of a new Ebola vaccine says she has experienced "no side effects at all". Stigma of caring for Ebola patients Jump to media player People who help those with Ebola in West Africa have to overcome not just the danger of that role, but also stigma and social isolation. Ebola vaccine flown to West Africa Jump to media player The first batch of a trail vaccine against the Ebola virus is being flown out to West Africa. Over a year ago, when the largest ever epidemic of Ebola began in West Africa, the general belief was that there was "no cure" for the disease. Mark Doyle visited the mural with MSF's manager of the treatment centre, Duncan Bell.